The Sheep is in the Basket! Hi there! The happiest of Tuesdays to you. This week I’ve got another new basket for ya. Now, I don’t keep things clean and organized much at all, because I don’t care to, but when I do the baskets are super useful and cute for it (how I wish I was a neat person but, alas, I am not). 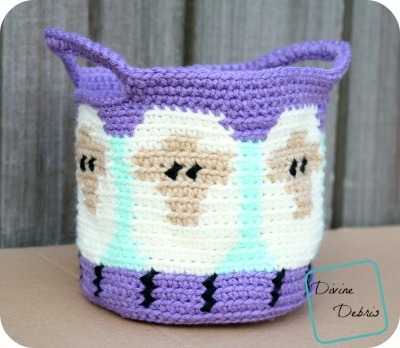 Like this week, the Dancing Sheep Basket, is another in my Dancing Sheep Line and it’s silly, easily to customize, and a really quick project. I made this in one night, I believe, and it holds so much… including the yarn for other projects, which is always helpful. I do hope you like it and check out the pdf for it in my Ravelry shop. Color A is purple, color B is black, color C mint, color D is cream, and color E is brown. When changing colors at the beginning of the row, just pull up the new color where you start the row. Every row of the sides are worked into the back loop only. Slip st into both loops at the end of the row, this will help keep your seam straight. Fasten off colors C and E.
Note: row 30 does not need to be worked in the BLO. This post is linked to Hookin’ on Hump Day 143 and Linky Ladies Community Link party #104. Thank you for sharing this pattern. Love the colours, just hope I can get them in the uk. Love your “dancing sheep” range. Just found this pattern while surfing thru Ravelry looking for something for a 10 year olds birthday…it is super adorable. 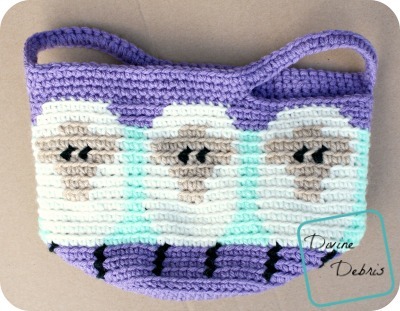 Definitely buying the pattern and adding your blog to my list of crochet favs! Thank you so much, if I have any issues is there a way to contact you for help? Cute, cute, cute! Thanks for sharing your pattern.